Beach Wedding Inspiration: The Tiny Details! It’s the tiny details that transform an ordinary beach wedding into an extraordinary one. Here are some tips to make your wedding extra special! 1. Continuity. Make the most out of the theme of your beach locale! Centerpieces, boutonnieres, the wedding bouquet and even the cake present an opportunity to incorporate your beach wedding theme into many aspects of the wedding and reception. Kimberly Aurora’s Etsy shop offers custom seashell bouquets. and unique way to tie in your beach theme and include a ribbon for your something blue. Plus, they won’t wilt or turn brown so you can display them forever as a reminder of your wedding day! 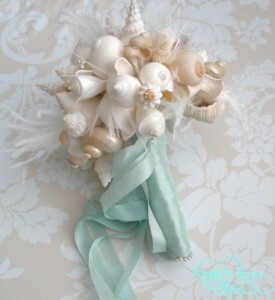 Warning: Just be careful tossing this wedding bouquet to the bridesmaids; the starfish and shells are pointy! 3. A beach cake. 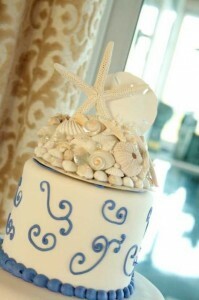 Take inspiration from your surroundings and opt for a seashell cake topper! You can find a variety of options and prices on Etsy! Starfish and seashell cake topper from iDoArtsyWeddings. 4. The seashell centerpiece. At CereusArt, hand crafted wine charms and shell garlands can be used to create a centerpiece or adorn guest chairs at the beach wedding ceremony or reception. Note that the seashell garland can serve as a foundation of the wedding reception centerpiece. To create a centerpiece, take a glass hurricane container, add sand, and then center a votive candle in hurricane and a few seashells. Now you’ve created a one-of-a-kind centerpiece for under $15 (excluding the price of the shell garland). 5. Boutonniere and bracelet corsages. For the groom, seashell boutonnieres can be found as low as $8 on Etsy. Bracelet corsages are a favorite among brides looking for something different than the normal corsage or wedding flowers this year. 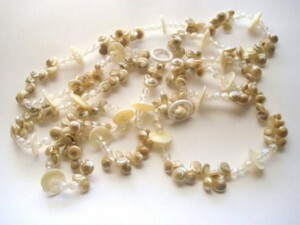 Maintain the continuity of your theme by including seashells in the bracelet. Are you planning a beach wedding? Share some of your best beach wedding ideas with us or ask a question in the comments! This entry was posted on Wednesday, October 30th, 2013 at 3:21 pm	and is filed under Weddings. You can follow any responses to this entry through the RSS 2.0 feed. Responses are currently closed, but you can trackback from your own site.